Explanation: Light from the stellar explosion that created this energized cosmic cloud was first seen on planet Earth in October 1604, a mere four hundred years ago. 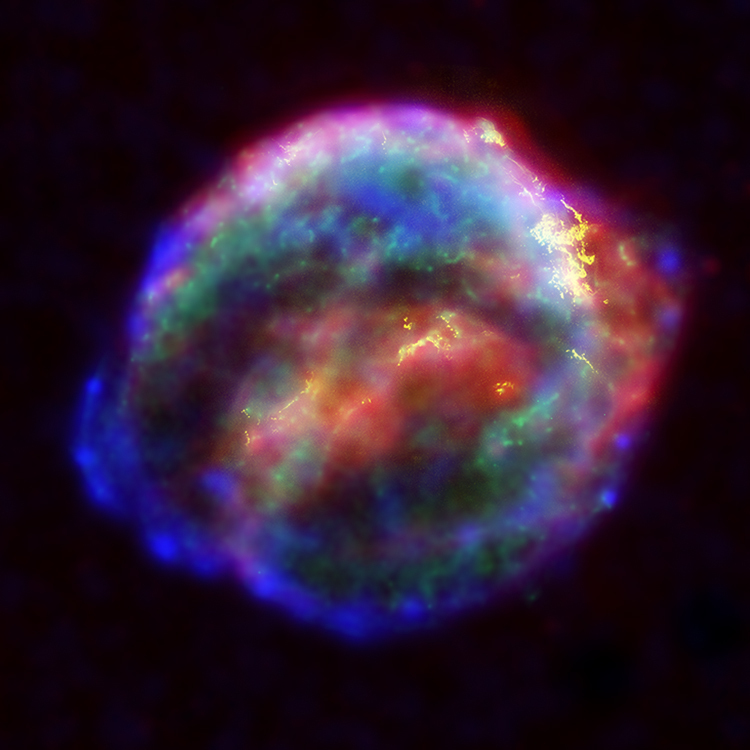 The supernova produced a bright new star in early 17th century skies within the constellation Ophiuchus. It was studied by astronomer Johannes Kepler and his contemporaries, with out the benefit of a telescope, as they searched for an explanation of the heavenly apparition. 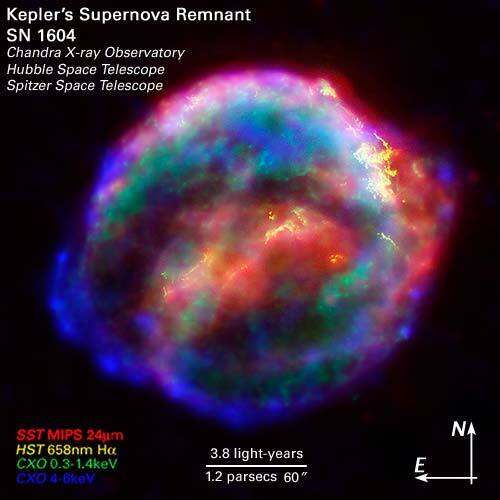 Armed with a modern understanding of stellar evolution, early 21st century astronomers continue to explore the expanding debris cloud, but can now use orbiting space telescopes to survey Kepler's supernova remnant (SNR) across the spectrum. In this tantalizing composite image, x-rays, visible light, and infrared radiation recorded by NASA's astrophysical observatories - the Chandra X-Ray Observatory, Hubble and Spitzer space telescopes - are combined to give a more comprehensive view of the still enigmatic supernova remnant. About 13,000 light years away, Kepler's supernova represents the most recent stellar explosion seen to occur within our Milky Way galaxy.